This game had two unique feature. The first being the ace "Jump Contests"
By the mid 1990’s, the Arcade was in a dire state. The Sony Playstation has shown you could play Ridge Racer at home, the Sega Saturn owned the beat em up market with arcade perfect conversions of X-Men: Children of the Atom & Virtua Fighter, and not one console had a perfect conversion of Primal Rage, which was good, as it sucked. To fight back, arcade developers Namco & AM2 (who relied on the arcade to test their next blockbusters) began making games that whilst not graphically perfect, did have a lot of extra features to give a new sort of gaming experience, the likes of which couldn’t be recreated at home. 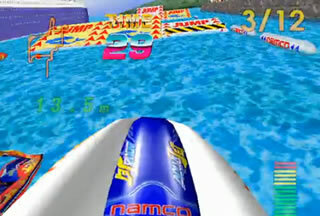 One of the earliest games was Aqua Jet, which opitimized what Namco was trying to do. 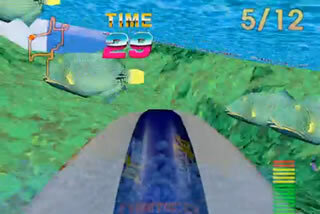 Aqua Jet was a racing game, but instead of using standard racing controller, you had to stand on a jetski attached to the front of the cabinet, and swing the contraption left and right, whilst a fan blows cool air into your face. All very snazzy, but what was the game like? One thing that stood out for me on this game was the sound, the music is one of the most memorable tunes in the history of arcade gaming, it suits the game perfectly, managing to convey the excitement of the race, as well as the fact you’re racing around a beach paradise. The graphics are built on the same engine as Ridge Racer & Alpine Racer, the mark 1 engine, so they’re not perfect, but nevertheless they’re quite pretty. Nothing to shout home about. What makes this game special to me was the little easter eggs and the courses. It’s really easy to finish the course, where the talent comes in is the little fun things dotted around the course. The fact you can scuba dive (throw the weight of the craft forward to dive beneath the surface of the water) is a great way to get a little extra speed (I haven’t worked out the physics behind that, either), and there’s also on all courses a “Jump Contest”, where you have to jump the furthest over 3 jumps. You race one lap of a fairly large course, and you try and come first, setting a fast time, and getting far jumps. Nothing special, but it’s incredibly polished, with a huge jet ski on the front, and really only lags behind Wave Race for the N64 as the best Jet Ski Game ever. It’s tricky to find nowadays in arcades, as – even though they were fairly durable, it took up a lot of space. If you do find one, you’re in for a treat, as it’ll only be 30p, but the most 30p you’ll ever spend.